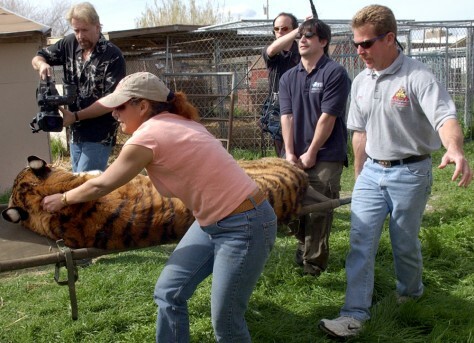 Groups want pet tigers banned in U.S.
Veterinary technician Norma Lagutchik, front left, and members of the International Fund for Animal Welfare remove a tiger from a home in Pahrump, Nev., March 1. Animals rescued from the home were being taken to the Wild Animal Orphanage in San Antonio, Texas, for rehabilitation. A camera crew, in background, records each removal for legal and humanitarian reasons.